Featuring Native American basketry of the West from Alaska to Arizona, this exhibit is expecting to draw in a good number of community members. Before hitting the official holiday season, be sure to visit Sharpsteen Museum to browse the new exhibit featuring Native American basketry from out West, ranging from Alaska to Arizona. This exhibit is showcased on the afternoon of Friday, Nov. 20. Imagine a Pomo woman thousands of years ago carefully gathering vines, honeysuckle and wisteria to create her baskets: a Coastal Miwok using spruce root, cedar bark, and swampgrass. Although now considered an art form, basket making in ancient times was created out of necessity and was an important part of the struggle to survive. The oldest known baskets have been carbon dated to between 10,000 and 12,000 years old, earlier than established discoveries of pottery. Basket making in the Old World dates back to ancient Mesopotamia and Egypt and was practiced by virtually all Native American tribes, many of which continue to this day, a tradition taught by elders to succeeding generations. Smaller baskets were created for gathering fruits, nuts, and grains, which was the main diet of many tribes. Others were larger or with a more distinct shape depending on the need, such as creel baskets used for collecting fish. Nomadic tribes, needing to move clothing and blankets from camp to camp for example, made baskets with a more pliable bottom enabling the carrier to balance the basket on his or her head for easy transport. The Pomo Indians of Central California were widely recognized as the finest basket makers in the world. Their use of plain, diagonal or lattice twining used separately in combination with one another was an almost unparalleled artistic choice. They had exceptional skills in coiled baskets and their use of feathers and shells added to their incredible beauty. Two feathered baskets are featured in this collection. Their neighbors, the Coastal Miwok, sadly have very few remaining examples of their basketry work. The missions recruited or enslaved the Indians early after their settlement and taught them to reject their native ways. Many died of disease. The most extensive collection of Coastal Miwok baskets was taken back to Russia after Fort Ross was abandoned in the 1830s and is now housed in a museum in St. Petersburg. The Lake Miwok and Yosemite Miwok, however, fared better. There will be a Yosemite Miwok basket in this exhibit. Baskets dating to the 1800s belonging to Dan Brown of Petaluma include those of the Pomo, Miwok, Hupa, Yurok, Karuk, and Klamath tribes of Northern California. From the coastal Olympic Peninsula of Washington baskets of the Makah and Quinault tribes to the Paiute and Washoe tribes of the eastern Sierra’s and Nevada, and to the Pima tribe of Arizona just to name a few, there will be plenty of baskets on display. Visit the museum for the preview of this incredible collection from 5:30 to 7 p.m. on Friday, Nov. 20. Brown will be in attendance to answer any questions you may have. This preview is open to the public; wine (no-host) and appetizers will be served. To further promote the importance of Native American basketry, visit the museum again between noon and 1:30 p.m. on Saturday, Dec. 12. Sharpsteen Museum is sponsoring another event, “Meet the Author and Book Signing.” Ralph Shanks, M.A., author and Lisa Woo Shanks, editor, of “Indian Baskets of Central California, Art, Culture and History”, will share their time and knowledge of this topic. 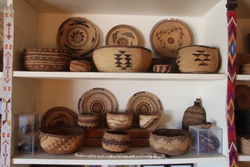 They will be covering Native American basketry from San Francisco Bay and Monterey Bay, north to Mendocino and east to the Sierra’s, including Calistoga’s own local tribe, the Wappo. This book is 176 pages of history and includes nearly 200 full-color photographs and illustrations, basketry of the Wappo, Pomo, Ohlone, Coast, Lake and Plains Miwok, Esselen, Huchnom, Patwin and many more. Described with knowledge and sensitivity, learn how to identify and authenticate your own collection. “An amazing book with information-packed chapters and exceptionally fine photography… written in a clear, concise style. This is an important and impressive work,” Bryn Barabas Potter said, the Curator of Basketry affiliated with the Southwest Museum of the American Indian and Autry National Center. This event will open with a presentation and short lecture. Books will be available for purchase and autograph. Don’t miss these two great events at your local museum. Any questions, please contact the Sharpsteen at 707-942-5911, visit http://www.sharpsteenmuseum.org, or Facebook page. The Sharpsteen Museum's permanent exhibits are designed to present the history of the upper Napa Valley from its pre-history to post-World War I with an emphasis on people and changes brought by the period of U.S. emigration and development. In addition to its many historical exhibits, the museum uses unique and extraordinarily extensive dioramas to depict Calistoga during its period as the elegant 1860s Hot Springs resort developed by pioneer, promoter, publisher, entrepreneur, and California's first millionaire, Sam Brannan. Sharpsteen Museum has special exhibits which change twice a year, every six months, and reflect the varied interests of the people of the Valley. They have ranged from antique silverware to model ships to historical musical instruments.